Redshirt junior gaurd Armel Potter attempts to make his way around a Stony Brook player. The Colonials lost to the Seawolves 77–74 in overtime. A season-opening blowout for men’s basketball ended in an overtime defeat. 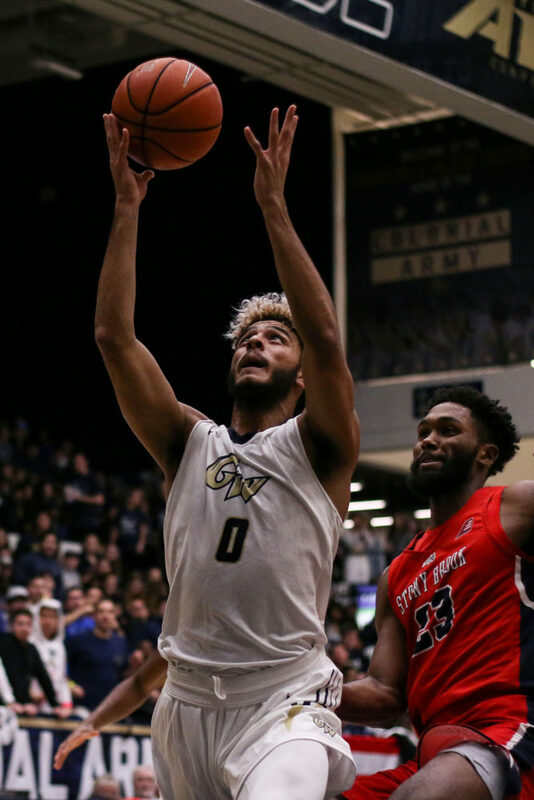 The Colonials kicked off the night on a 22-0 run over Stony Brook, but an abysmal performance from the free throw line resigned GW (0-1) to a 77–74 overtime loss against the Seawolves (1-0) at the Smith Center Tuesday. The Seawolves went 17-for-24 from the free-throw line but capitalized on their chances in overtime, improving to 4-for-6 in the extra frame. The Colonials finished their home opener shooting 47.1 percent on a 16-for-34 clip from the charity stripe and went 3-for-12 from the line in overtime, missing key opportunities to tie the score and regain control of the game. 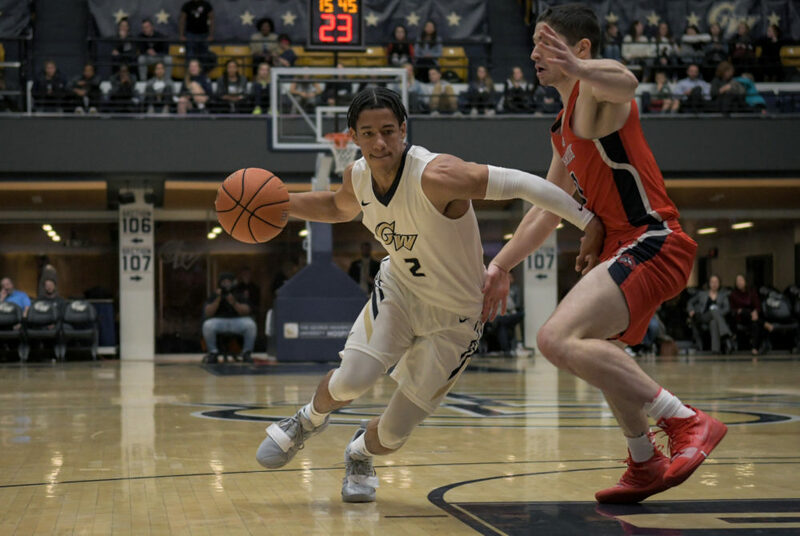 During the Colonials’ opening run, freshman guard Shandon Brown contributed his first collegiate basket and redshirt junior guard Armel Potter helped push the momentum with four points. At one point in the fiery start, GW dropped nine points in less than two minutes. The Seawolves did not score until the 10th minute of play, finding the scoreboard behind two foul shots. But from that point on, they out-shot GW 24-14, scoring at a 9-for-19 clip. Going into halftime, the Colonials were up 34–24, but quickly saw their lead vanish in the second half as they were outscored 39-29. Potter – who led the team with 21 points, including nine in overtime – said the team’s struggle from the line came back to hurt them down the stretch. GW was shooting 44.0 percent from the field before the half, including four successful three-point shots and 8-for-12 shooting from the free throw line. The Colonials held Stony Brook to 26.5 percent shooting in the first half. But one the clock started again for the second half, the Seawolves improved their shooting from the field to 50.0 percent. Stony Brook tallied three more rebounds in the half and sank more free throws, shooting at a 57.1 clip compared to the Colonials’ 50.0 percent. Sophomore guard Terry Nolan Jr. put distance between GW and Stony Brook early in the second half with a four-point play after being fouled while shooting a deep three-pointer to make the score 37–27. But the Seawolves kept pestering the Colonials and capitalized on GW’s eight second-half turnovers and won the battle under the glass 18-15. GW only made five free throws in 10 opportunities in the second frame. Junior guard Justin Mazzulla drives the ball toward the basket during Tuesday’s game against Stony Brook. A layup by Stony Brook redshirt junior forward Akwasi Yeboah in the final seconds tied the score at 63–63 and forced the game into overtime. Freshman forward Mezie Offurum, who was one of the starting five in his first official collegiate match, opened the extra period with a free throw to put the Colonials ahead, but Stony Brook took its first lead of the game on a three-pointer from redshirt sophomore guard Andrew Weber. Once the Seawolves were on the board above the Colonials, they did not let go of their advantage. Another Stony Brook three-point shot pushed the lead further away from GW and the Colonials gave up easy points on missed free throws. Ten different Colonials saw time in the game, including all three freshmen on the roster, who combined for 17 points and nine rebounds. The Colonials struggled on the glass, getting out-rebounded 46-38 on the night and 7-1 in overtime. Stony Brook also topped GW in offensive rebounds, tallying 18 on the night to the Colonials’ 10. Toro ended the night with a double-double, tallying 13 points and 11 rebounds. The Colonials committed 17 turnovers on the game. Eight of those turnovers came in the second half, which the Seawolves then converted into 12 points. The Colonials return to action when they take on Siena at the Smith Center Thursday. Tip-off is scheduled for 7 p.m.